After a reconnaissance by me in 2000, our island expeditions began with the very first in 2001; there were 12 scientists and their students on GG I, and some of us remained in the islands for over two months. Fieldwork, especially in this island paradise goes quickly but the actual science takes time, and it is heartening that this very first expedition (of eight!) is still yielding results. 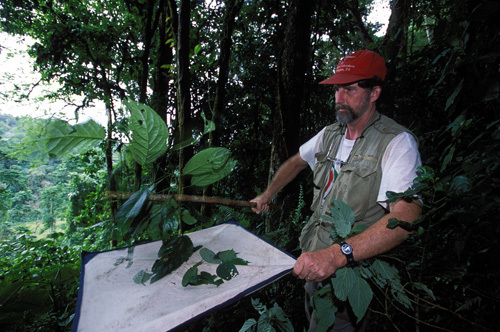 There were two arachnologists (spider specialists) on GG I: Dr. Charles Griswold of the Academy and his graduate student Joel Ledford of the University of California, Berkeley (now Dr. Ledford). Charles and Joel worked on both islands as did we all. Upon our return to the California Academy of Sciences, Charles and Joel sent some of the spiders they collected on the islands to different experts on various spider groups. 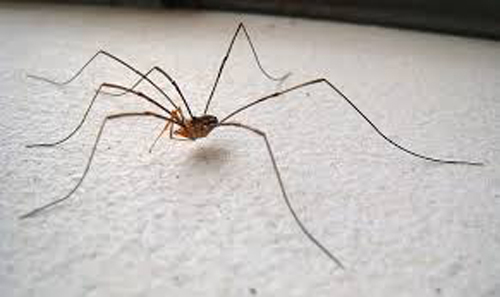 Among the spiders sent were members of the Family Pholcidae; these very long-legged creatures are known as “daddy long-legs spiders” or cellar spiders here in the US. and Smeringopus principe, named for the island and collected at a locality along the road from Santo Antonio to Sundy, Príncipe. There will be many more new species described as all of our collections, not just the spiders, are open to biologists around the world. Many have already been on loan for many years. 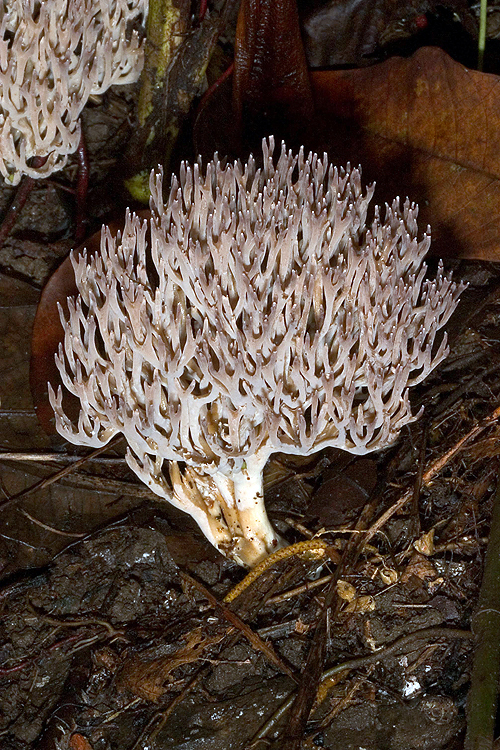 Readers will rememberthat GG II and GG III were joined by mycologists, Drs. Dennis Desjardin and Brian Perry of San Francisco State University. 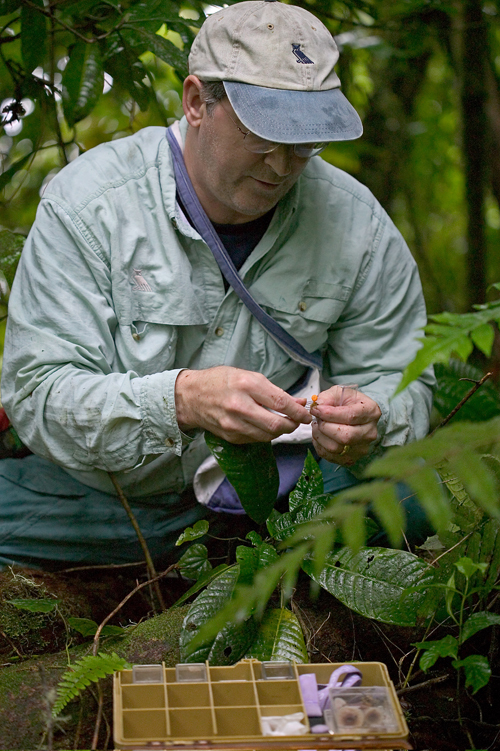 Where only 10-15 species of mushrooms had been described from the islands earlier, these two workers found over 200 species, with about 30% estimated to be new to science. In modern times the first actual product of scientific research is a formal, peer-reviewed publication in a scientific journal. Some journals are considered more prestigious than others (usually based on their selectivity), and it is considered quite an honor to get the “cover article;” i.e., the article highlighted/illustrated on the cover of the journal in which it occurs. Evolution Volume 69, Number 4, 2115. A new publication by one of us, Dr. Rayna Bell (GG VI and VII), has just been so honored (above), and also the cover image is a photo by our veteran photographer Andrew Stanbridge (GG V-VIII)! The paper is another on the evolution of three of the islands’ remarkable frog species: the São Tomé giant treefrog and oceanic treefrog, and the Príncipe oceanic treefrog. 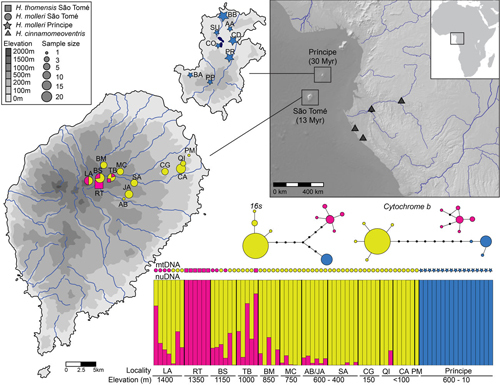 Using DNA data, Dr. Bell found that the common ancestor of the São Tomé giant tree frog and São Tomé oceanic tree frog originally dispersed from mainland Africa to São Tomé first, where it differentiated into the giant species (H. thomensis) in the higher elevations and the lowland oceanic tree frog (H. molleri). In addition, the common ancestor of the tree frog population on Príncipe came from São Tomé rather than the reverse. This is in contradiction to the “progression rule” that assumes that colonization events (dispersal) usually proceed from an older island to a younger one as in Hawai’i. Rayna has found that the Príncipe oceanic tree frog has undergone enough genetic change to be recognized as a distinct species from the very similar São Tomé lowland tree frog and that in addition, the lowland species has recently begun to hybridize with the giant tree frog from which it used to be geographically separated. The cause of this has been the upward expansion of agricultural lands into the primary forests of the highlands, bringing the two species closer together. GG IX will take place in September-October of this year, and in the next blog I will introduce the participants and describe this year’s biodiversity education project. 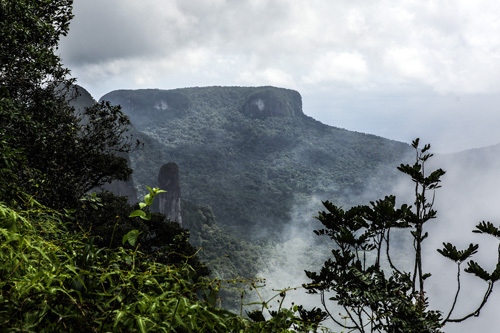 Mesa (from the north), Príncipe . The top is carpeted with virgin, untouched forest. Our botanists have sampled it only briefly during GG VII. We must return. We are most grateful to Arlindo de Ceita Carvalho, Director General, Victor Bomfim, and Salvador Sousa Pontes of the Ministry of Environment, Republic of São Tomé and Príncipe for their continuing authorization to collect and export specimens for study, and to Ned Seligman, Roberta dos Santos and Quintino Quade of STePUP of Sao Tomehttp://www.stepup.st/, our “home away from home”.We gratefully acknowledge the support of the G. Lindsay Field Research Fund, Hagey Research Venture Fund of the California Academy of Sciences for largely funding our initial two expeditions (GG I, II). The Société de Conservation et Développement (SCD) and Africa’s Eden provided logistics, ground transportation and lodging (GG III-V), and special thanks for the generosity of private individuals who made the GG III-VII expeditions possible: George G. Breed, Gerry F. Ohrstrom, Timothy M. Muller, Mrs. W. H. V. Brooke, Mr. and Mrs. Michael Murakami, Hon. Richard C. Livermore, Prof. & Mrs. Evan C. Evans III, Mr. and Mrs. Robert M. Taylor, Velma and Michael Schnoll, and Sheila Farr Nielsen; GG VI supporters include Bom Bom Island and the Omali Lodge for logistics and lodging, The Herbst Foundation, The “Blackhawk Gang,” the Docent Council of the California Academy of Sciences in honor of Kathleen Lilienthal, Bernard S. Schulte, Corinne W. Abel, Prof. & Mrs. Evan C. Evans III, Mr. and Mrs. John Sears, John S. Livermore and Elton Welke. GG VIII was funded by a very generous grant from The William K. Bowes Jr. Foundation, and substantial donations from Mrs. W.H.V.“D.A.” Brooke, Thomas B. Livermore, Rod C. M. Hall, Timothy M. Muller, Prof. and Mrs. Evan C. Evans, Mr. and Mrs. John L. Sullivan Jr., Clarence G. Donahue, Mr. and Mrs. John Sears, and a heartening number of “Coolies”, “Blackhawk Gang” returnees and members of the Academy Docent Council. Once again we are deeply grateful for the support of the Omali Lodge (São Tomé) and Bom Bom Island (Príncipe) for both logistics and lodging and for partially sponsoring part our education efforts for GG VII and GG VIII.